When it comes to creating a culture of caring and summer giving in North Delta/ Surrey, Ride2Survive proactively engages everyone in maintaining a spirit of generosity. 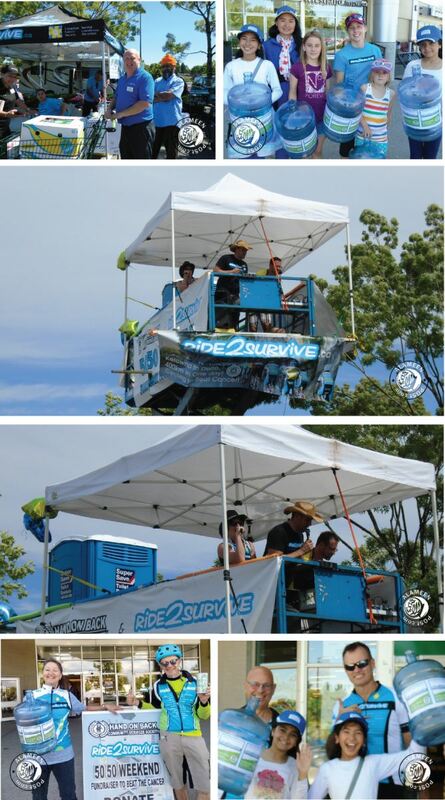 On Friday June 15th, 2018, Graham Street, Richard Gestle, and Siobhan Coates went up the lift and spent 50 hours, 50 feet in the air on a crane to raise money with Ride2Survive for the Canadian Cancer Society, taking place at the Scottsdale Center in Delta. This event was designed by the Ride2Survive organization and started by Kerry and Vicki Kunzli, from North Delta, which is devoted to generating donations for the Canadian Cancer Society to assist in Brain Cancer, Ovarian Cancer, Pancreatic Cancer, Pediatric Cancers and other hard cancers that need more research. 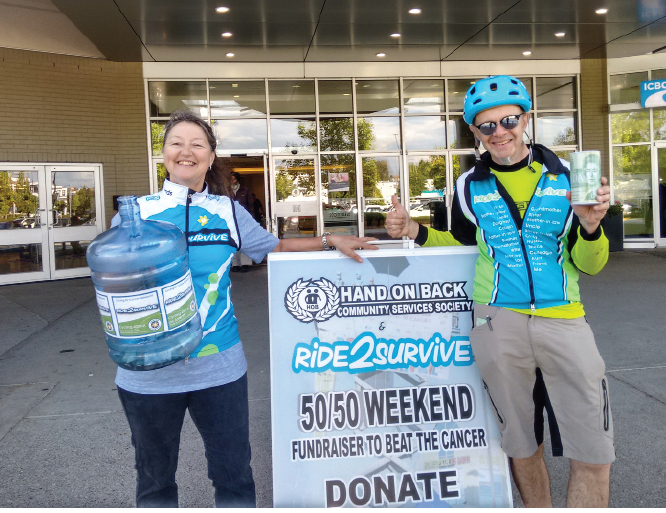 Ride2Survive is a non-profit, fully volunteer organization based here in British Columbia, and from Delta, which offers cycling events as its primary source of fundraising. So far, they have raised more than $500 000 for the 2018 calendar year, with fully 100% of these donations going towards cancer research. We are all volunteers. The brave participants in the air stayed up for the full 50 hours, as encouragement to those below to donate to the cause. On the ground, with our directors coordinating with Alison Gestle, Aileen Maas, Ryan Beaumont, and Amarjit Dhadwar our amazing volunteers and students helped participate, collecting funds, coordinating traffic flow into the event, decorating the area, entertaining the group with dancing and even utilizing their public speaking skills, communicating in Punjabi to inform local residents and shoppers of the event to encourage donations. “Our sincere hope is to protect and help our communities cope. I myself am a cancer survivor. We need to be engaged in an arduous process of healing that is collaborative, enhancing, inclusive, practical, pro-active and responsible,” said Richard Gestle, an event organizer and a team riding captain. The celebration atmosphere at the Scottsdale Center was "over the top"--to see the community come out together to welcome us and our efforts. It demonstrated the hope that Ride2Survive provides to those suffering and reveals the support for all those involved in battling the disease. It also allows our future generations to know that they are not alone in fighting against cancer. ”Looking at cancer in a more positive light, improved treatments with prevention strategies are helping Canadians live longer because of improvements in surgical techniques and aggression, chemotherapy and radiation therapy. Thanks to research, Canadians have been able to dramatically improve the 5-year survival rate from 25% in 1947 to over 60% today. We are very gratified for the depth and breadth of community sponsorship and support. We thank Save-on-Foods, local businesses and patrons for helping us,” said Siobhan Coates. “No matter how young or old, everyone benefits by participating in the Ride2Survive community service fundraiser. We have the opportunity to help our children and youth become great citizens in hopes that they will be compassionate people who are innovative, organized and responsible. Through our participation with community leaders, educators and parents, we can help them develop internal strengths and become part of a new generation of young people prepared to lead others, take on responsibility, and handle tomorrow’s health and social challenges,” says Suzanne Hayat, a director of Amazing Tutors’ Children’s Foundation. The event concluded with the raising of $25,758 to go towards cancer research funded by the Canadian Cancer Society. We feel extremely blessed to have been given the opportunity by Ride2Survive to engage with the community in such an important way, and to get our students out and volunteering to aid research that will positively impact so many lives. Here at Amazing Tutors’ Children’s Foundation, we believe that providing our students with positive and community based volunteer activities is an essential part of their development into responsible and capable citizens whom we hope will continue to impact their communities throughout their lives. We wish the Ride2Survive team all the best as they ride from Kelowna climbing up the Coquihalla Highway and tracing through the Cascade Mountains. Cyclists will pedal from 3:30 am, making their way, with stops along the way, to 7919 Scott Road in North Delta at about 10:45 pm on Saturday June 23, 2018. This ride comprises a gruelling and a challenging physical and emotional journey, pointing out that those who battle cancer have a physical and emotional fight far greater than anything we could imagine. This press release has been authorized by Kerry Kunzli.